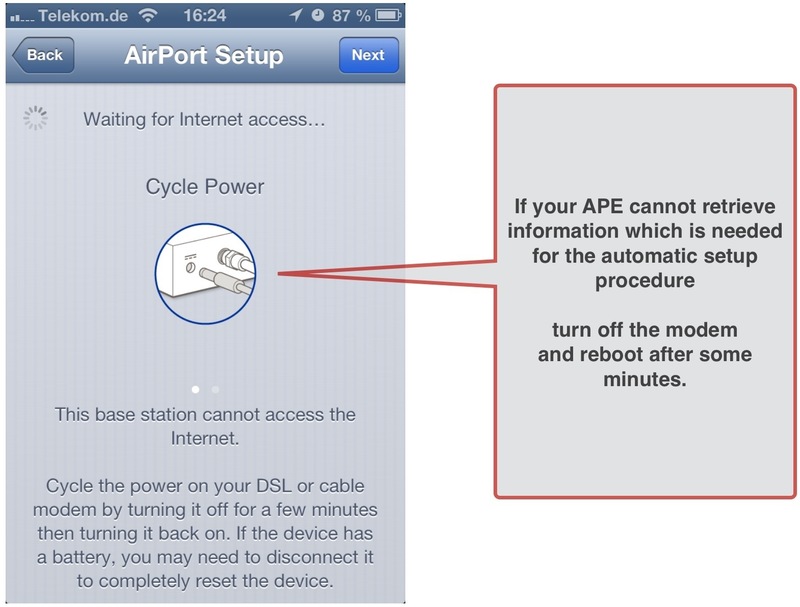 Part (2) of my articles about networks is about the installation of an Apple Airport Extreme router (APE). The internet connection is established via a Cisco modem which is connected to a cable internet plug connection. You remember, a router is the device which mainly does the addressing within your local area network (LAN) that means, assigns IP addresses to all devices. Furthermore it handles the communication between a device inside the LAN with another device as well as the communication between LAN devices and ressources outside your LAN e.g. webservers like Apple’s iCloud servers or WordPress servers where the blog http://iNotes4You.com is hosted. The main content of this article is also available in German and refers to the German Cable Internet provider UNITYMEDIA. It can be downloaded from my page Documents. Usually you will het the modem from your ISP. The description is also valid for an Apple Airport Express router or Apple’s Time Capsule, a router with an integrated Harddisk. You can download the app from Apple’s App Store for free. 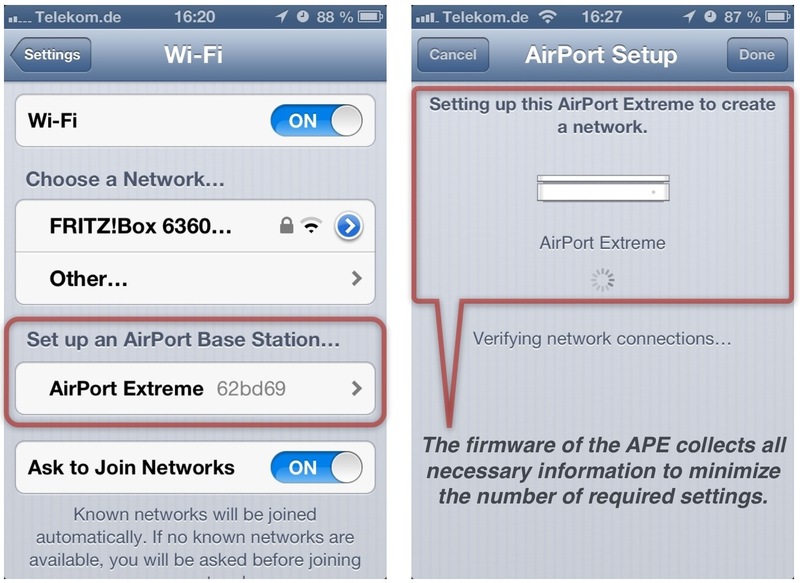 The iOS app Airport Utility has limited capabilities and not all settings for your network can be done with this app. For example: You cannot set the signal strength (10-100%) with the iOS app. Follow these steps in the order specified. Step 1 Connect the modem to the multimedia connector with a coaxial cable. A modem (modulator-demodulator) is a device used to connect a computer or router to a telephone/cable line to allow the computer to connect to the Internet. It modulates a carrier signal to encode digital information, and also demodulates such a signal to decode the transmitted information. The goal is to produce a signal that can be transmitted easily and decoded to reproduce the original digital data. Step 2 Connect the modem to the power supply. Wait until the LEDs indicate a functioning connection to your ISP. It may take up to 30 min. Step 3 Connect the APE to the modem with an Ethernet cable. Ethernet cabling is standardized. If you go to a store you may find a variety of “categories” of cabling. These categories tell you the quality of the cabling. The quality determines, essentially, how much the cable can handle. Recommendation: Cat 6 – works for 10/100/1000Mb. Step 4 Connect the APE to the power supply. The configuration with any iOS device and the helper apps Settings and AirPort Utility starts. Open Settings on your iPhone or iPad and tap on WiFi. The APE already is sending signals so that your device suggests the set up of a WiFi network. 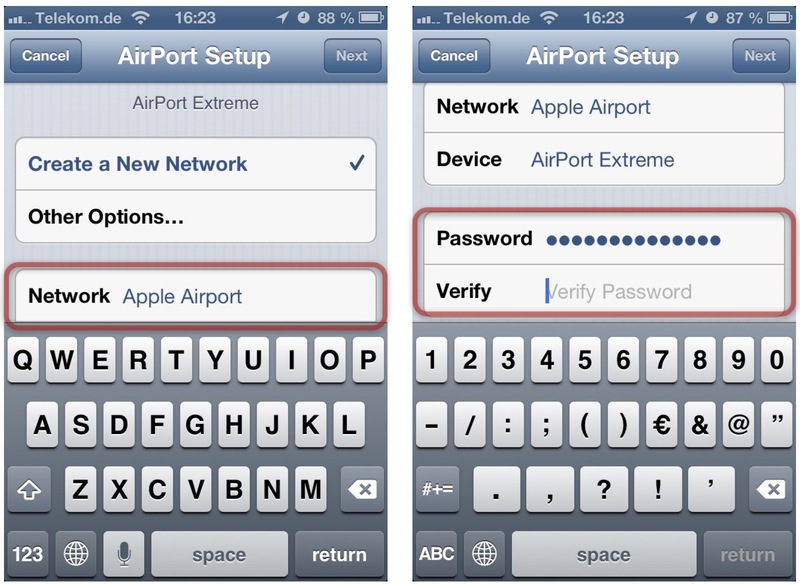 Tap on the right-pointing arrow to set up an AirPort basestation. Enter a name for your network and set a password. Other users like your neighbors, if not too far away, will see this name as an additional WiFi network. Use a strong password for joining this network. Tap on Next and that’s all. Your new WiFi network will connect all your devices with the internet after entering the password you set for your network. Apple’s ZEROCONF technique minimizes your efforts to install a usable internet access. is a set of techniques that automatically creates a usable Internet Protocol (IP) network without manual operator intervention or special configuration servers. Zero configuration networking allows devices such as computers and printers to connect to a network automatically. Without zeroconf, a network administrator must set up services, such as Dynamic Host Configuration Protocol (DHCP) and Domain Name System (DNS), or configure each computer’s network settings manually, which may be difficult and time-consuming. Look at the details to get a deeper understanding of what happened. To see the details of your own WiFi network go to Settings – WiFi and tap on the right-pointing blue arrow of you network. Go to the bottom and tap on ‘Manage network’. This will open the Airport Utility. 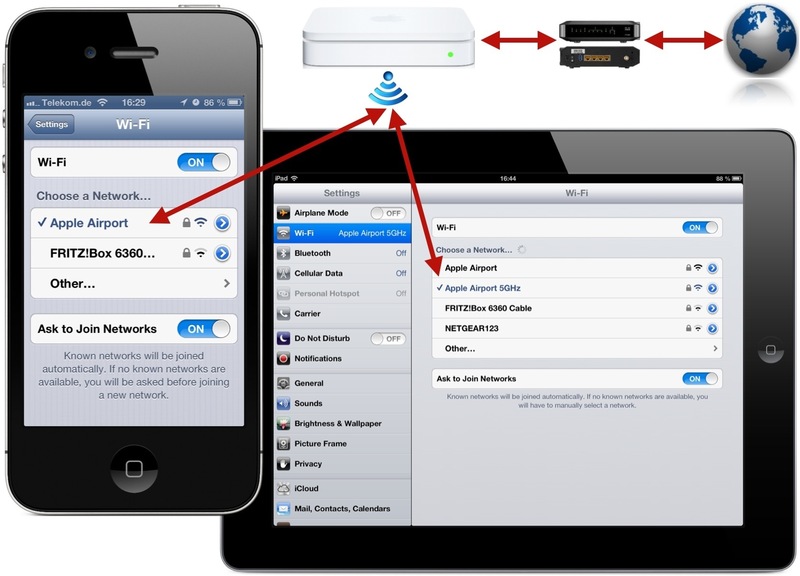 Airport Utility can be used to individualize the configuration. the APE acts as a DHCP server and assigns private IP addresses (10.0.1.x) to all devices joining the WiFi network after entering the password. the APE reserves an IP address for all devices. 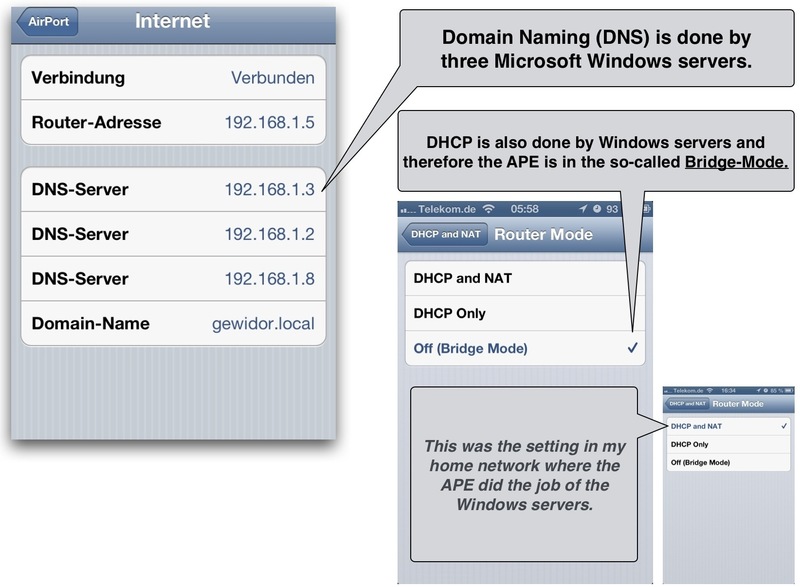 Reservations are useful if you want that the DHCP feature of your APE assigns a fixed IP to your devices. Otherwise DHCP is free to assign any free IP address in the range 10.0.1.2 – 10.0.1.200 every time you join your network. The APE works in the 2.4 and 5 GHz frequency band. The iPad is able to connect on the 5 GHz band and I named this (second) network as ‘Apple Airport 5 GHz’. If you have interference problems with other WiFi networks you may vary the channel or move over to the 5 GHz network. With the help of Airport Utility for PCs I additionally limited the signal power to 50% which is enough to get connected in all rooms and hampers other WiFi capable devices outside my home to detect my network. The result is a working internet connection checked by the app Fing which is available at Apple’s App Store. A well-known problem may arise and is frequently mentioned in several forums. There is an easy way to fix it. Just do what Apple tells you in the help text. 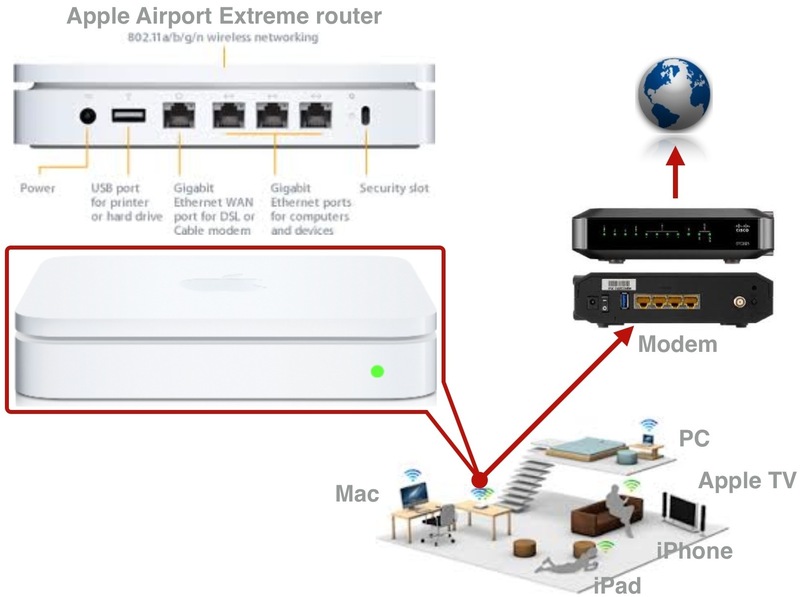 If the Airport Extreme router has to be installed in a Microsoft Windows network with an existing internet connection via DSL some changes in the settings of the APE are necessary. It’s because the server of the Windows network is the DHCP server now and therefore assigns the IP addresses instead of the APE. But don’t get nervous. The strategy of Apple’s Zeroconf is to make it easy for you. And it’s easy because the APE automatically collects relevant informations about the existing network and then sets most of the relevant values automatically. The last article about networks will answer the question how to get into a private network with varying WAN IPs from outside the LAN e.g. For accessing files on a computer inside the LAN.